Pine Bush, New York (USA) -- TRY this: place a forkful of food in your mouth. It doesn’t matter what the food is, but make it something you love - let’s say it’s that first nibble from three hot, fragrant, perfectly cooked ravioli. 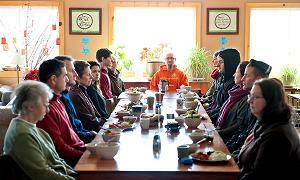 << Diners wait until everyone is seated at the Blue Cliff Monastery. Lately, though, such experiments of the mouth and mind have begun to seep into a secular arena, from the Harvard School of Public Health to the California campus of Google. In the eyes of some experts, what seems like the simplest of acts - eating slowly and genuinely relishing each bite - could be the remedy for a fast-paced Paula Deen Nation in which an endless parade of new diets never seems to slow a stampede toward obesity. Mindful eating is not a diet, or about giving up anything at all. It’s about experiencing food more intensely - especially the pleasure of it. You can eat a cheeseburger mindfully, if you wish. You might enjoy it a lot more. Or you might decide, halfway through, that your body has had enough. Or that it really needs some salad. It’s this byproduct of mindful eating - its potential as a psychological barrier to overeating - that has generated excitement among nutritionists like Dr. Cheung. O.K., so you don’t happen to live in a Buddhist monastery. You can still give mindful eating a spin by incorporating a few chilled-out gestures and rituals into your regular calorie intake. WHEN YOU EAT, JUST EAT. Unplug the electronica. For now, at least, focus on the food. CONSIDER SILENCE. Avoiding chatter for 30 minutes might be impossible in some families, especially with young children, but specialists suggest that greenhorns start with short periods of quiet. TRY IT WEEKLY. Sometimes there’s no way to avoid wolfing down onion rings in your cubicle. But if you set aside one sit-down meal a week as an experiment in mindfulness, the insights may influence everything else you do. PLANT A GARDEN, AND COOK. Anything that reconnects you with the process of creating food will magnify your mindfulness. CHEW PATIENTLY. It’s not easy, but try to slow down, aiming for 25 to 30 chews for each mouthful. FIND A BUDDHIST CONGREGATION where the members invite people in for a day of mindfulness. For New Yorkers, it’s an easy drive to the Blue Cliff Monastery, about 90 minutes north of the city: bluecliffmonastery.org/ on the Web.